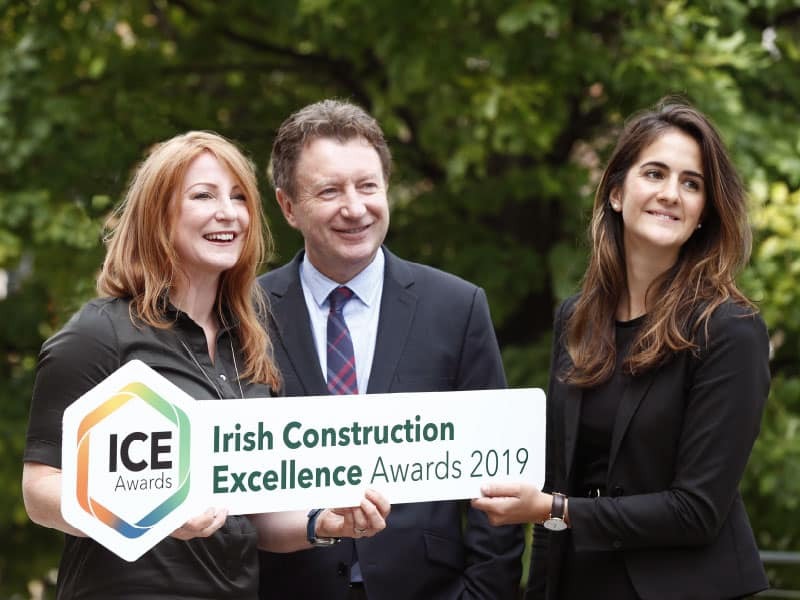 The call has been made for entries to the 2019 Irish Construction Excellence Awards, the premier awards which recognise performance excellence in the contracting sector in Ireland. Entry to the awards is open to: building contractors, civil engineering contractors, specialist M&E contractors, specialist contractors, construction product suppliers and third-level colleges offering certain construction related courses. The submission deadline is Friday, 30 November 2018. The ICE Awards cover a broad range of construction projects such as residential, civil engineering, commercial, industrial, healthcare and education. There are associated industry awards for health, safety and wellbeing, construction product, third-level course and industry contribution. The project categories are for projects completed in the Republic of Ireland within 24 months of the submission deadline date, except where stated. Previous winning projects have included Adare Manor, The Luas Cross City, the National Gallery of Ireland – Refurbishment of Historic Wings, Páirc Uí Chaoimh and Industry Contribution Award winner Frank Matthews (Mercury Engineering). There is a dedicated ‘BIM Excellence’ category designed to showcase BIM expertise in the sector. There are two stages involved in the ICE Awards judging process – the assessment stage and the interview stage, where finalists make presentations to the judges, showcase their projects and have Q&A sessions. The interview stage is taking place in Dublin on 25, 26 and 27 February 2019. Hosted once again by former Cork All-Ireland winning camogie captain Anna Geary, the 2019 ICE Awards Gala Event will take place at the Mansion House, Dublin, on Friday, 29 March 2019. At the 2018 ICE Awards Gala, the Peter McVerry Trust was the beneficiary of the raffle held. A total of €4,150 was raised on the night. Focus Ireland will be the charity partner in 2019. The judging panel includes Dermot Clohessy, former COO and executive director of IDA Ireland; Phelim Devine, design director/deputy project director of the National Paediatric Hospital Development Board; Jerry Grant, managing director of Irish Water; Seán McCarthy, project management and Lean/IPD consultant who was site manager of projects and construction at the Intel Leixlip campus; Ruth Morrow, professor of architecture and director and co-founder of the Tactility Factory; Niall Kane, head of digital engineering at VINCI Construction UK; Brian McClinton, director at Linesight; Keith Elliott, associate director of PM Group; Emma Hayes, managing director of Digital Built Consultants and Dublin Institute of Technology Lecturer. Pictured above at the launch: ICE Awards Judges, Emma Hayes, Managing Director of Digital Built Consultants and Brian McClinton, Director, Linesight with Carolina Keegan, Senior Events Manager, Mansion House Events. Click to view information on the Categories, Judges, the Stages, Gala Event and the 2018 ICE Awards finalists and winners. For further information please email Awards Coordinator Mona McCrea. Past winning projects include; Adare Manor, The Luas Cross City, the National Gallery of Ireland – Refurbishment of Historic Wings, Páirc Uí Chaoimh and Industry Contribution Award winner Frank Matthews (Mercury Engineering).